The Great Lakes Center at Buffalo State is offering two new master’s programs in Great Lakes ecosystem science beginning August 2013. Both programs share certain required and elective courses, but they differ in their objectives. The master of science program is designed to prepare its graduates for management positions in the environmental sciences; the master of arts program prepares graduates for research positions or academic careers. 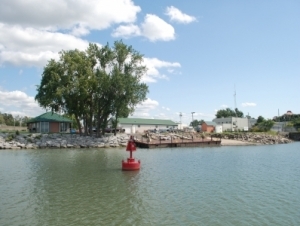 With water from four of the five Great Lakes flowing past the Great Lakes Center Field Station at the mouth of Lake Erie, both programs offer extensive hands-on experience. The field station maintains three large research vessels and a fleet of smaller boats. The programs respond to demand from both students and employers throughout the Great Lakes ecosystem. “These programs meet a need for people trained to apply scientific data and processes to the questions and concerns related to the Great Lakes,” said Alexander Karatayev, professor and director of the Great Lakes Center. The master of science program is modeled on the guidelines for professional science master’s (PSM) degrees. PSM programs provide students with business leadership training through courses in communication, economics, and project management. Plans are in the works to apply for official affiliation status with the national PSM agency—the Keck Graduate Institute. Government agencies, environmental consulting groups, and non-governmental agencies have indicated, through surveys and meetings, support for such a program. Eligible students are invited to apply.